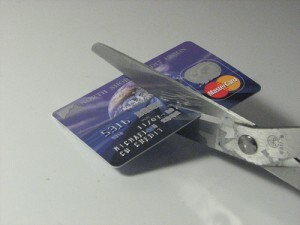 This was an original post I did on credit card mistakes at ChristianPF.com. I’ve adapted it a little for my site. We all make mistakes, it’s in our nature. Sometimes we make them because we don’t know any better — other times we make them even though we do. Most of us have made pretty big flubs with the plastic – I know I have – so it’s always good to get some helpful reminders on handling credit cards so we can avoid mistakes and eliminate credit card debt. Okay, this sounds silly, how can you not recognize that you have credit card problems? I spent the majority of my college years and shortly after living the high life without any regard to the thousands of dollars I was racking up! I spent the rest of the time out of college trying to eliminate my credit card debt! I didn’t even realize that I had a credit card problem. I just figured this was a normal part of existence and that once I made more money, then I would pay off that debt! Little did I realize that I needed to make some drastic changes! Get real with yourself and ask if you’ve got some spending issues. Credit card debt help comes in the form of helping yourself first and realizing you have a problem and need to eliminate debt! This recently happened to me. I got my email notification of the statement, logged it in the back of my mind that I needed to pay that bill and unfortunately got busy and never bothered to pull that statement out of the back of my mind until two days after the bill was due. I plain forgot! I know what you’re thinking – just automate your bill pay! Yes, I should do that, but I do like to take a look at what’s on the statement and make sure everything’s correct. This kind of forces me to do that. Making a late payment even if it is only by a few days can rack up ridiculous charges that only compound your debt. Those annoying charges can also have an impact on your credit scores. Being vigilant about paying your debt and paying it on time is key to eliminating your credit card debt. This is where it all begins doesn’t it? You’re a willing victim to the crazy cycle. You buy something you can’t afford and think, “I get paid in two weeks, I’ll just put it on the credit card and as soon as I get the bill I will pay it off” and then something else comes up. Emergencies happen or you find some other trinket you want to buy and you put that on your credit card too. At the end of the of the month you receive a hefty bill. If you only pay what you can and wind up leaving a balance on the card that accrues interest at insane amounts, you’re asking for trouble and perpetuating the cycle! Just think, with a little discipline and some self control you could’ve avoided unnecessary spending and used that money to open a Roth IRA or fund some other type of investment account. If you want to eliminate your credit card debt, you must stop adding new charges and begin paying your bill in full each month. It puzzles me that more people don’t call their card companies to ask for credit card debt help. What I mean is that you can negotiate things like interest rates, late payment fees or even payment plans. If nothing else, it doesn’t hurt to give them a call and find out what they can do for you. The person who never asks, never receives. Now of course there is no guarantee that the credit card company will do anything, but wouldn’t it be nice to know if they were willing to do something? Eliminating credit card debt is not easy, but don’t make it harder on yourself by making simple mistakes that can easily be avoided. Readers, what other tips would you offer to eliminate credit card debt? Want to know how long it will take you to pay off your credit cards? Check out my Credit Card Payoff Calculator!